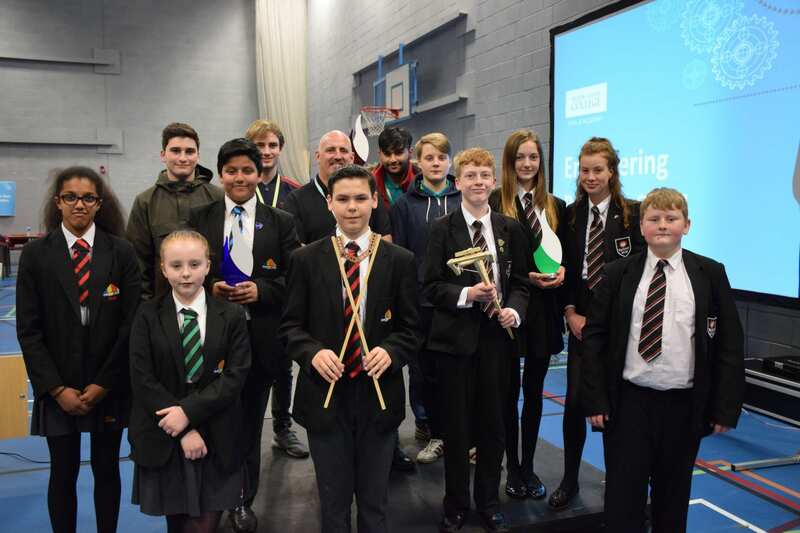 Teams of budding engineers from East Lancashire schools pitted their inventive brains and practical skills against each other at Nelson and Colne College’s Engineering Because challenge. Students were tasked with designing and producing a lifting device within a budget and competing schools Bowland High School, Colne Primet Academy, St Christopher’s CE High School, Marsden Heights Community College, Shuttleworth College and West Craven High School took part in Year 9 and Year 8 competitions. Several teams from NCC also competed in a college age group category. Once manufactured and trialled, the teams then put their prototype lifting devices to a final test – to remove cube, sphere and pyramid shaped objects from a box without standing within half a metre of the box. Colne Primet Academy won the Year 8 prize and West Craven High School went home with the Year 9 award after impressing the judges with their products. Nelson and Colne College Curriculum Leader for Engineering Mark Rosenthal said: “I was delighted to see so many students engaging in Engineering and I’m absolutely certain that we have seen some future engineers in this competition. “Engineering Because was a test of so many different skills and the students demonstrated these admirably throughout the day. “I was very impressed with the innovative designs of the lifting devices but also that they were extremely effective. Around 95% of the devices created managed to pick up all of the items in the box, in particular the pyramid object which was the most difficult to remove.